The Retro-Adapter-Professional is for use with Sony cameras (A-mount). Use your normal lenses in reverse position with this adapter position and get exiting makros from them ! 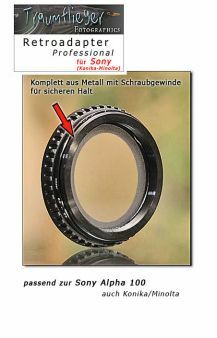 If you have other lenses then 58mm filter diameter, than you can adapt them with our other rings in the shop. This Product was added to our catalogue on Wednesday 16 May, 2007.